Make mine a large peanut Latte!!! So it would appear that the high pace of life gets to elephants too and they need a caffeine fix to keep the going!!! 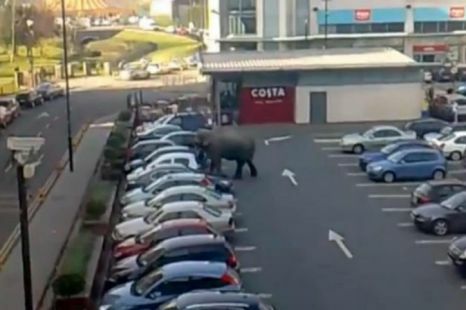 Below is a picture of an Elephant making a quick wee stop off at Costa Coffee while he does a runner from his handlers who were trying to give him a shower in a car wash!!! I really don’t blame him would want to wash your nether regions in car wash for all of Cork City to see. Make that Non fat Latte please, I'm watching my weight!! Cheer up Santa there's an Elephant outside!! LOL I see what you mean Santa does not compare to runaway elephant.